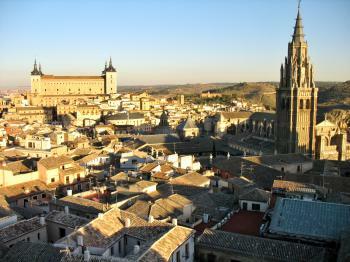 The Historic City of Toledo holds a cultural and monumental heritage of several historic civilizations. The city has Roman origins and was then called Toletum. The Romans left a circus and an aqueduct, the Visigoths remains of the city walls, the Emirate of Cordoba the Puerta Vieja de Bisagra, there are Jewish monuments and some outstanding 15-16th century constructions (Cathedral, San Juan de los Reyes, Santa Cruz hospital). The city is also known for the emergence of a hybrid Mudéjar style, a symbiosis of techniques and ways of understanding architecture resulting from Muslim, Christian and Jewish cultures living side by side. This can be seen in the Santiago del Arrabal and the Puerta del Sol. Toledo is a lovely city for a weekend break, it deserves much more than only a daytrip from Madrid. I arrived on Friday afternoon at the bus station and walked uphill to the old town (not recommended for those with a lot of luggage or in bad shape). The town has a spectacular location on top of a hill, like a medieval fortress with thick walls to deter attackers. The streets in the historic center are very narrow and just made for walking (although the locals successfully navigate their cars through this labyrinth). The most popular route in Toledo seems to be the walk from the Puerta Bisagra to the Cathedral. The Puerta Bisagra is the most prominent gate for visitors arriving by car or from one of the stations. From there it's up and up, passing the Santiago del Arrabal's pretty Mudejar tower and the decorative Puerta del Sol. My personal favourite on this route is the Hospital Santa Cruz. Its interior is an oasis. And oh, that stairwell! Finally, the Cathedral, is a huge Gothic masterpiece. It can easily manage the crowds of visitors that flock in every hour of the day. Another great walk leads through the former Jewish neighbourhood. Two synagogues that after 1492 were turned into churches are left and open to visitors. There are also a number of other buildings worth seeing in this area. Toledo owes its WHS status to its urban continuity. Comparisons to Rome and Florence are made in the Advisory Body Evaluation: ".. any attempt to make a survey of the monumental heritage of Toledo would be an impossible undertaking". The archeological remains of early rulers like the Romans and the Visigoths are scarce however. The main influences on the current city are medieval: the period of the coexistence of the Moors, Jews and Christians. Within 'The Historic City of Toledo', the Cathedral could even earn its own place on the list, as it is considered the magnum opus of the Gothic architecture style Spain and one of the finest cathedrals in Europe. P.S. : at the time of writing, two of Toledo's main sights were closed for restoration: the Alcazar and the El Greco Museum. I visited this WHS in June 2015. Well, let's start from the logistics. 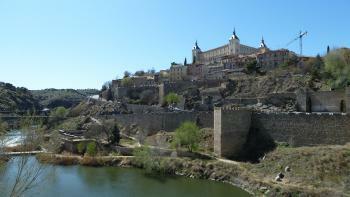 Toledo is very close to Madrid and is therefore well placed on the tourist map. It is fully packed with interesting sites, churches, walls, the Alcazar, a great cathedral and has some great culinary delicacies. Most travel to Toledo by public transport or with a coach as a day trip from Madrid. There are escalators from the bus/coach parking area up to the Jewish quarter meaning that the road from the city gate to the cathedral is pretty much always packed with tourists. Yet Toledo is a complex labyrinth of narrow roads and alleys, so it is easy to choose a slightly different path which still leads to the main sites. As I said, the streets and alleys are narrow enough to deter most tourists from using a car even though locals use them and parking can be a nightmare. However, I was lucky enough to choose a very cheap hotel with parking with easy enough access through a side gate and up a few narrow streets. I'm used to driving in difficult conditions and Toledo's narrow streets can be quite difficult to handle for the average traveller. 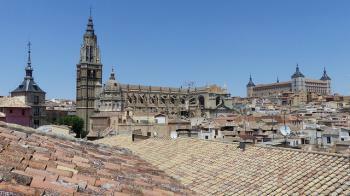 The hotel was very close to the cathedral and the view from the terrace alone would have been worth the trip (photo). There are several Miradors within the city but the best panoramic views of Toledo are to be had from the opposite bank of the Tagus River. There's one that can be easily reached on foot, close to the Puente de Alcantara or else close to the medieval Puente San Martin. However, the best view by far is from the Mirador del Valle although it would be quite a hike uphill. If like me, you visit by car make sure NOT to follow the Mirador del Valle indicated on Google Maps. It won't take you to the right place. Instead drive to the opposite side of the Puente de Alcantara and drive up the steep hairpins just beneath the luxury Hotel Parador. This Mirador can also be reached using the tourist train if you don't have a car. I really enjoyed my time in Toledo even though I only spent 2 days here. It's a perfect destination for a weekend trip and I'd choose it over Madrid any time! Toledo is one of Spain's classic travel destinations, and certainly one of the most interesting ones - a great combination of culture, history and architecture that has few rivals anywhere. Among the countless attractions are one of the largest and most impressive Gothic cathedrals anywhere, an impressive fortress, a wealth of churches (many of them former synagogues and mosques), a wide range of museums, priceless paintings (especially by local hero El Greco), a scenic location atop a hill surrounded by the Tajo, and an unmistakable skyline dominated by the cathedral and the alcázar. Toledo was the capital of Spain for several centuries, and is still its religious centre. I found it to be one of the most interesting and beautiful cities I have ever been to, and I would not hesitate to go back. I took a bus from Madrid to Toledo. I only had a day, but my initial doubts of making the trip were forgotten once I stepped foot in this magnificient city. The diversity of architecture and sites alone make it an exquisite destination. The towering cathedral, winding streets, well-preserved city gates, and wonderful views together made my visit to Toledo one of my most lasting memories in Spain. If you are ever in Spain, make sure you plan a trip to here. I am unsure how extensive the inscribed area is, but there are many worthwhile sites throughout the city. The outskirts of the city are interesting as well and worth exploring. Staying more than a day would be preferable. I wandered and explored the city at my leisure. However, it was getting late, luckily I was barely able to gain entrance into the 13th century Cathedral of Toledo (last person of the day!). The impressive cathedral is of High Gothic design and is in excellent condition. I was in two minds about visiting Toledo, not because I didn’t think it would be a worthwhile trip, but I was unsure if I could give it enough time to do the city justice. In the end I plumped for an excursion on the last day of a busy weekend trip to Madrid. Toledo is only 25 minutes away from the Spanish capital, however we soon found out that trains were infrequent and got full rather quickly, but we managed to nab ourselves a couple of seats (if you are planning to go by train I would recommend booking in advance as our options were severely limited on the day). The super slick high-speed train deposits you at the rather lovely neo-Moorish station in Toledo, which is worth taking a few moments to admire before heading off to the walk or bus journey to the centre. The short walk gives a nice first view of the city as you see it sitting up on the other side of the river, showing you that you may have to do a fair bit of climbing during your visit. It is very easy to see the traditional medina style lay out of the city centre; the narrow cobbled streets winding up and down hill instantly brought back memories of North Africa. The main highlight is the cathedral, with its overwrought gothic altar and impressive collection of art, from a rather astonishing amount of European masters. For us though Toledo's greatest attraction was El Greco's magnificent Burial of the Count of Orgaz , a truly superb piece of art work from an artist that I was not especially fond of previously. It can be found in Santo Tomé church on the edge of the former Jewish district, and provides a nice focal point from which to explore Toledo's former multi-cultural heritage. After seeing the architectural fruits of the period of la convicencia, we grabbed a few tapa and meandered back towards the station. This daytrip did allow us to see all the highlights of Toledo, however I feel that it would really be worth staying a night to absorb more of the city's atmosphere, as well as giving you a chance to see the place when it is not so over run with day tripping tourists. It is a very worthy WHS with some magnificent art works that would reward a more leisurely stay. I have heard that when people visit Florence they actually swoon (as in Room with a View) as they are overcome by the art and history. This has happened to me only once and it wasn't in Florence but in Toledo, in the cathedral to be exact. The Gothic cathedral is a marvel of art and atmosphere. One can truly feel the centuries of continuity. The amount of art, statues, glass, metalwork, woodwork, books, old master paintings, is staggering. Unfortunately we got a late start and only spent the afternoon and evening in the city, so I would recommend getting there early so as to have enough time to see everything. The convenient and modern escalator system rising up the side of the hill can be hard to spot when walking from the train station so if you want to take this route it's probably best to ask for directions at the station before setting off. Going the long away around through the main gate, however, affords the experience of entering the city the way one probably would have back in the Middle Ages. As we were about to leave we happened upon a candlelight procession in honor of the Mater Dolorosa winding its way through the streets, a lovely and romantic way to end the day. *coughs* Dusty but lovely. There are many things to see in the city, from ornate and expensive churches to the artwork and more modest home of El Greco. Getting to the top of the hill is fun too; they actually have elevators built into it! If you can, get away from the city itself and into the hills where you can get an absolutely stunning panoramic shot or two. We travelled to Toledo by train from Madrid, and took a local bus from the station to Zodcover Square. From there we explored the labyrinth of narrow streets on foot. Today the old town appears to be dominated by the huge cathedral, but amongst all the narrow lanes there is a plethora of little churches as well as mosques and synagogues to be found. Somehow these managed to survive the dark period of the inquisitions, and hearken back to earlier times when there was religious tolerance in the town. Magnificent cathedral, impressive city walls, narrow winding cobbled streets, continental cafes, friendly convents, damascene artefacts, Moorish mosques and a wealth of history. Toledo has it all! We visited the house where the painter El Greco lived and worked for years. Many of his paintings were on display. In one set of 12 pictures, each of the Apostles had small parts of each picture unfinished. For example, there would be a hand, but no fingers. While we were there, some important looking officials arrived for a tour of the museum. They rode in a large limousine, complete with guards and guides. We drove down a street into a small plaza and found several narrow streets came into the area, but only one seemed to go out. As we were trying to decide what to do, a small truck about our size went through, so we followed, then found we had plenty of room. That is, about 2 inches between each mirror and the buildings. Sieges and Battles: Siege of the Alcázar Jul 21 - Sep 27 1936. 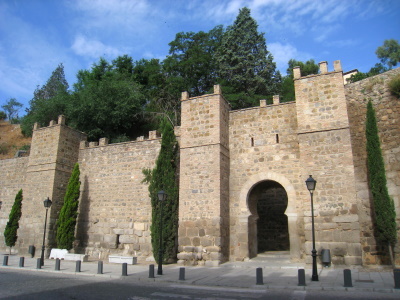 By the Republicans against the Nationalist force holding the Alcázar The building was largely destroyed by artillery, air bombardment and mining. In late September the building had almost been over-run but held out long enough to be relieved by Franco's forces. 384 Community Members have visited.